Download "SHAWNEE STATE UNIVERSITY RESPIRATORY THERAPY PROGRAM Application for Admission and Autobiography Form"
3 SHAWNEE STATE UNIVERSITY MINIMUM CRITERIA FOR ADMISSION CONSIDERATION To be considered for admission to the Respiratory Therapy Program, the following items must be received in the Admissions Office by April 1: Application to Shawnee State University Respiratory Therapy Application and $30.00 Health Science Application fee Official High School Transcript; or, Official GED Score Transcript and Partial H.S. 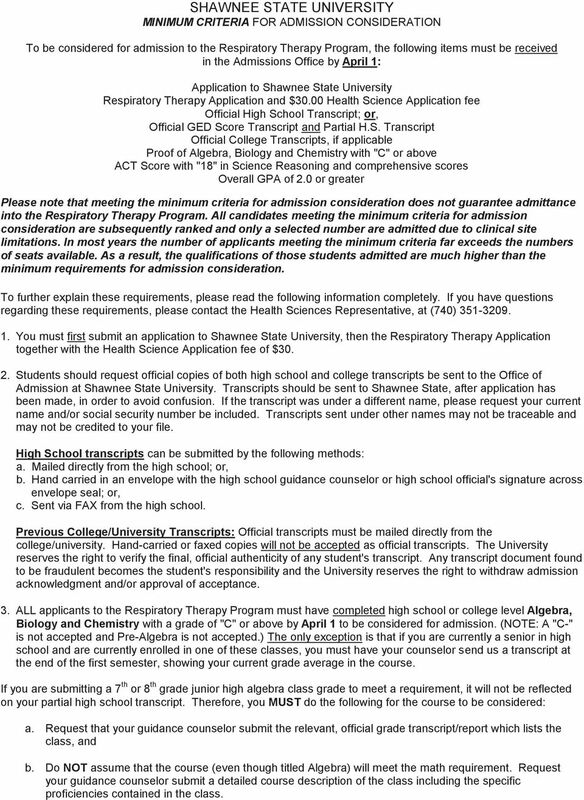 Transcript Official College Transcripts, if applicable Proof of Algebra, Biology and Chemistry with "C" or above ACT Score with "18" in Science Reasoning and comprehensive scores Overall GPA of 2.0 or greater Please note that meeting the minimum criteria for admission consideration does not guarantee admittance into the Respiratory Therapy Program. All candidates meeting the minimum criteria for admission consideration are subsequently ranked and only a selected number are admitted due to clinical site limitations. In most years the number of applicants meeting the minimum criteria far exceeds the numbers of seats available. As a result, the qualifications of those students admitted are much higher than the minimum requirements for admission consideration. To further explain these requirements, please read the following information completely. 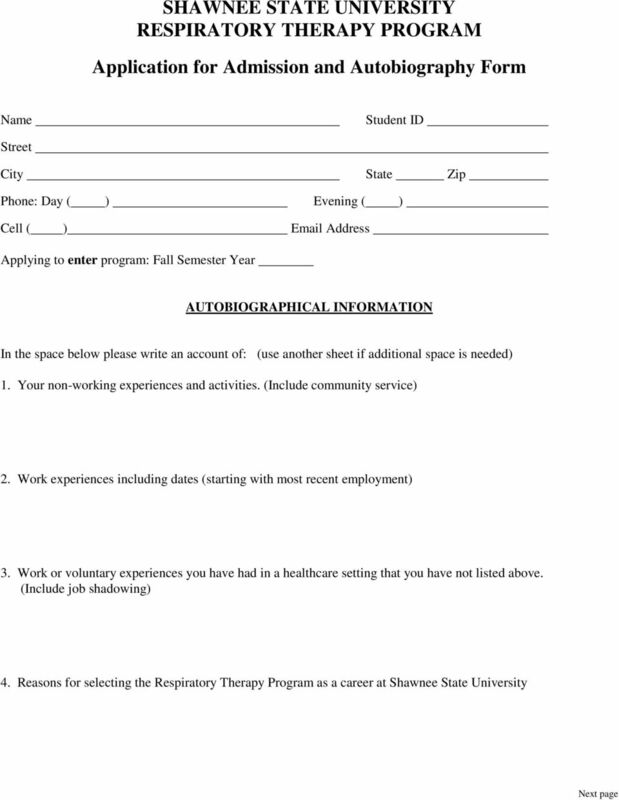 If you have questions regarding these requirements, please contact the Health Sciences Representative, at (740) You must first submit an application to Shawnee State University, then the Respiratory Therapy Application together with the Health Science Application fee of $ Students should request official copies of both high school and college transcripts be sent to the Office of Admission at Shawnee State University. 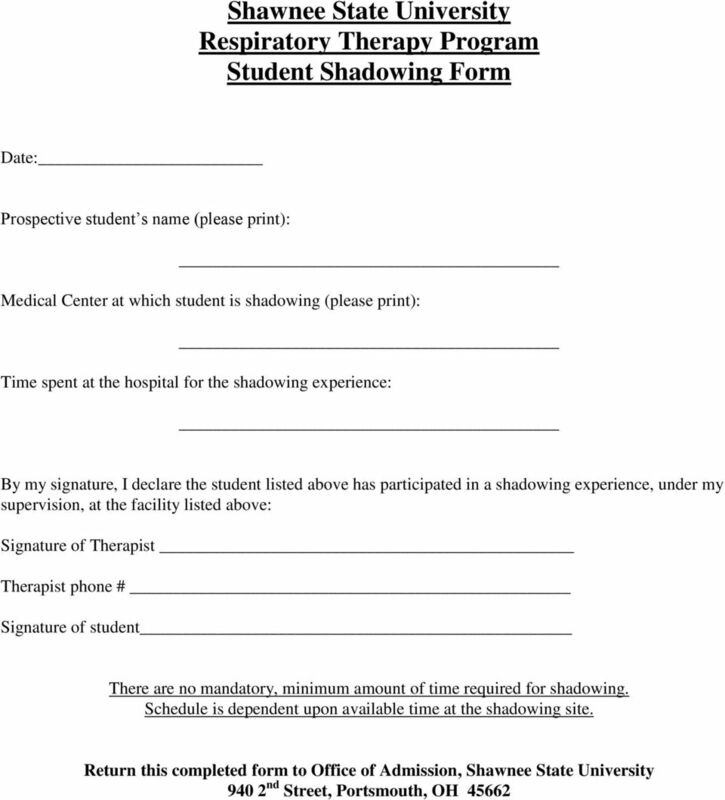 Transcripts should be sent to Shawnee State, after application has been made, in order to avoid confusion. If the transcript was under a different name, please request your current name and/or social security number be included. Transcripts sent under other names may not be traceable and may not be credited to your file. High School transcripts can be submitted by the following methods: a. Mailed directly from the high school; or, b. Hand carried in an envelope with the high school guidance counselor or high school official's signature across envelope seal; or, c. Sent via FAX from the high school. Previous College/University Transcripts: Official transcripts must be mailed directly from the college/university. Hand-carried or faxed copies will not be accepted as official transcripts. The University reserves the right to verify the final, official authenticity of any student's transcript. Any transcript document found to be fraudulent becomes the student's responsibility and the University reserves the right to withdraw admission acknowledgment and/or approval of acceptance. 3. ALL applicants to the Respiratory Therapy Program must have completed high school or college level Algebra, Biology and Chemistry with a grade of "C" or above by April 1 to be considered for admission. (NOTE: A "C-" is not accepted and Pre-Algebra is not accepted.) The only exception is that if you are currently a senior in high school and are currently enrolled in one of these classes, you must have your counselor send us a transcript at the end of the first semester, showing your current grade average in the course. If you are submitting a 7 th or 8 th grade junior high algebra class grade to meet a requirement, it will not be reflected on your partial high school transcript. Therefore, you MUST do the following for the course to be considered: a. Request that your guidance counselor submit the relevant, official grade transcript/report which lists the class, and b. Do NOT assume that the course (even though titled Algebra) will meet the math requirement. Request your guidance counselor submit a detailed course description of the class including the specific proficiencies contained in the class. 4 4. All applicants must have completed the ACT test with a minimum score of "18" in the Science Reasoning area (or if taken before October, 1989, a 16 in Science Reasoning or Natural Sciences). 5. Applicants must be eligible to enter MATH 1200 and ENGL 1101S as the program curriculum describes. Therefore, students should take Shawnee State's mathematics and English placement tests as early as possible. 6. All applicants will be notified in writing when the above criteria have been met and the file forwarded to the department for consideration. IF YOU HAVE NOT RECEIVED THIS CARD, YOUR FILE IS NOT COMPLETE. It is your responsibility to make sure all requirements are submitted before the deadline. 7. Applicants can schedule a meeting with the Program Leader for information. 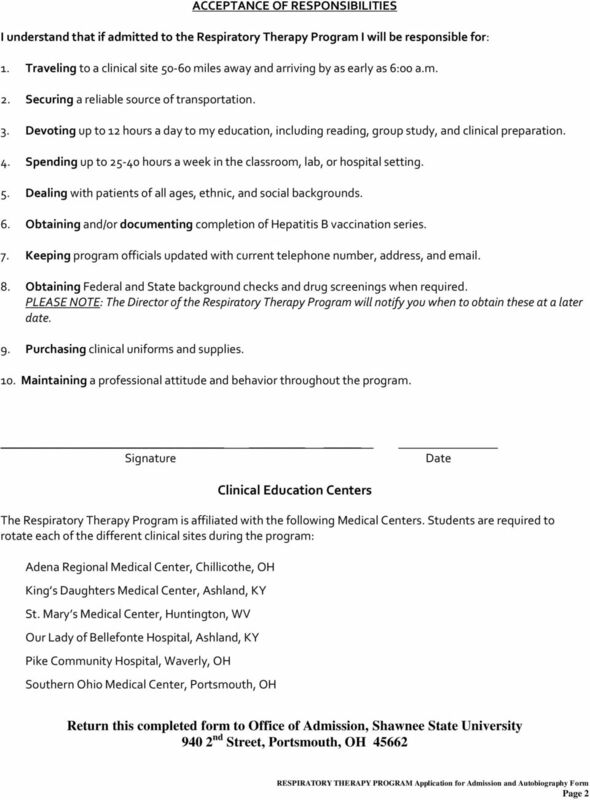 Questions may be directed to and meetings scheduled with Amy France, Program Leader by calling (740) or the Health Science Representative at (740) Final decisions regarding admission to the Respiratory Therapy Program will be made using an objective, point ranking, system. Factors included in this ranking system include the following: a. Grade received in algebra, biology, and chemistry; b. Level of algebra, biology, and chemistry taken by the student (i.e. high school, college remedial, or college); c. ACT Science Reasoning and Comprehensive scores; and, d. Number of college credit hours completed with a "C" or higher; e. Overall GPA of 2.0 or greater. 9. Students will be notified of admission status with the Respiratory Therapy Program. Those admissions will be in one of the following categories: a. 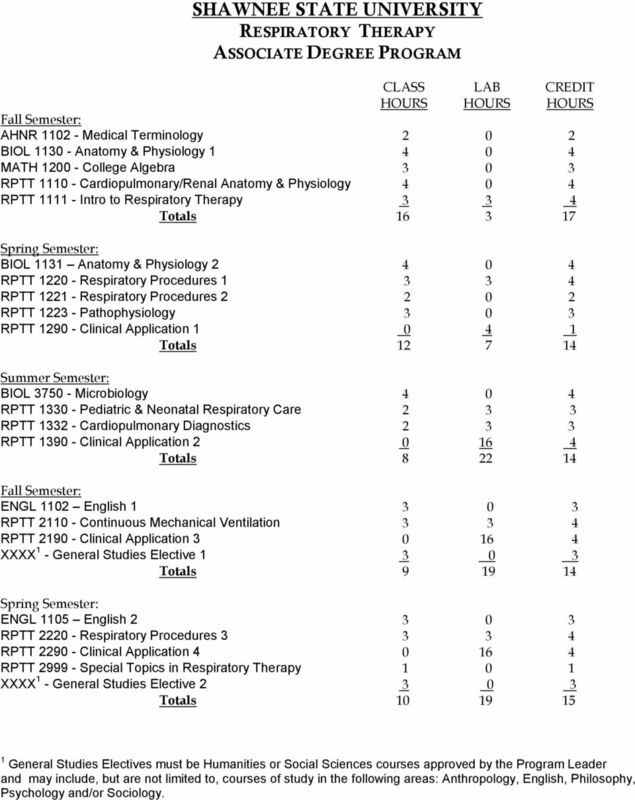 Full Admit - These applicants have been admitted to the Respiratory Therapy Program and are included in the class for the following Fall Semester; b. Alternate - These applicants will be considered for positions in the class beginning the following Fall Semester if positions become available (Applicants in this category, if a position does not become available, may work to improve their applicant status [point ranking] and apply the following year. It is strongly recommended that these applicants contact the Chair of the Respiratory Therapy Program to determine how to improve their status for the following year. 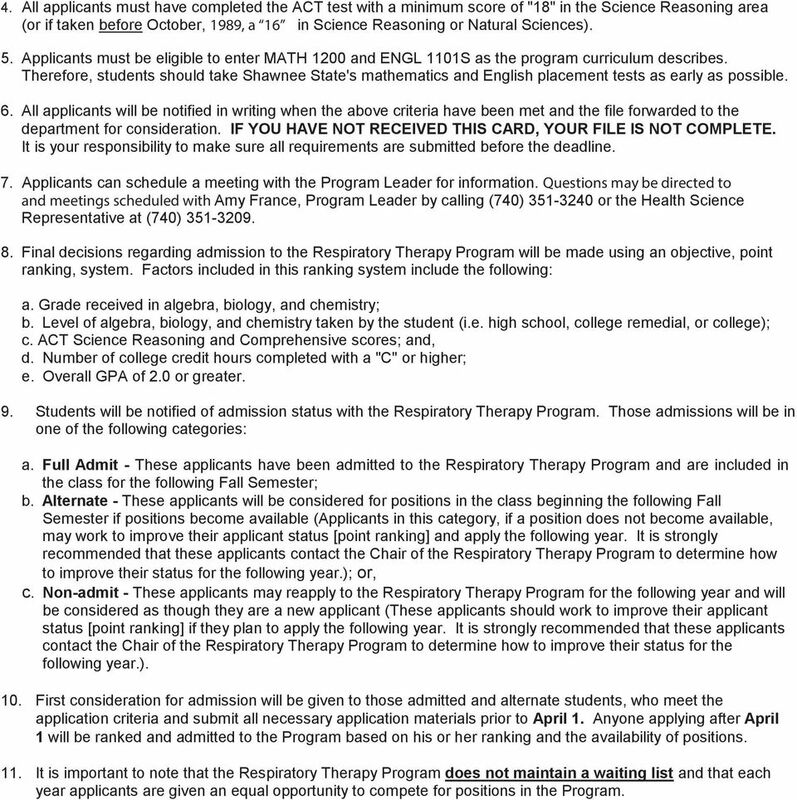 ); or, c. Non-admit - These applicants may reapply to the Respiratory Therapy Program for the following year and will be considered as though they are a new applicant (These applicants should work to improve their applicant status [point ranking] if they plan to apply the following year. It is strongly recommended that these applicants contact the Chair of the Respiratory Therapy Program to determine how to improve their status for the following year.). 10. First consideration for admission will be given to those admitted and alternate students, who meet the application criteria and submit all necessary application materials prior to April 1. Anyone applying after April 1 will be ranked and admitted to the Program based on his or her ranking and the availability of positions. 11. It is important to note that the Respiratory Therapy Program does not maintain a waiting list and that each year applicants are given an equal opportunity to compete for positions in the Program. 5 SHAWNEE STATE UNIVERSITY RESPIRATORY THERAPY ASSOCIATE DEGREE PROGRAM CLASS HOURS LAB HOURS CREDIT HOURS Fall Semester: AHNR Medical Terminology BIOL Anatomy & Physiology MATH College Algebra RPTT Cardiopulmonary/Renal Anatomy & Physiology RPTT Intro to Respiratory Therapy Totals Spring Semester: BIOL 1131 Anatomy & Physiology RPTT Respiratory Procedures RPTT Respiratory Procedures RPTT Pathophysiology RPTT Clinical Application Totals Summer Semester: BIOL Microbiology RPTT Pediatric & Neonatal Respiratory Care RPTT Cardiopulmonary Diagnostics RPTT Clinical Application Totals Fall Semester: ENGL 1102 English RPTT Continuous Mechanical Ventilation RPTT Clinical Application XXXX 1 - General Studies Elective Totals Spring Semester: ENGL 1105 English RPTT Respiratory Procedures RPTT Clinical Application RPTT Special Topics in Respiratory Therapy XXXX 1 - General Studies Elective Totals General Studies Electives must be Humanities or Social Sciences courses approved by the Program Leader and may include, but are not limited to, courses of study in the following areas: Anthropology, English, Philosophy, Psychology and/or Sociology. Twenty-four months to a top medical career Physician assistant (PA) is one of the fastest-growing health careers. The Department of Labor projects a 39% increase in physician assistant jobs through 2018. HCC Coleman College Dental Hygiene Program Fall Application Packet Application Deadline: April 8, 2016, 12:00noon Thank you for your interest in the Coleman College for Health Sciences Dental Hygiene Program.